These pretties are perfect for summer. 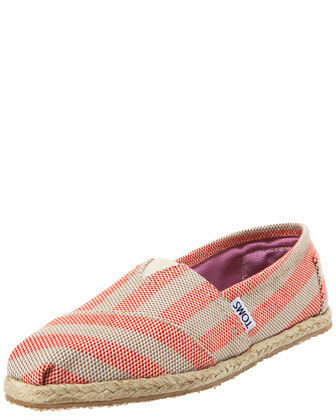 I love the color, the striped pattern, the comfort, AND the price. Oh! And you know the deal - one for one - for every pair you buy Toms will donate a pair to a child in need. Doesn't get much better than that. I wore my TOMS wedges this weekend and they are the most comfortable things on earth! I might cave this year and get a pair of flats. Those are so cute! Hope you are doing well and I look forward to meeting you in NY! Love these! I have my eye on a pair of the wedges! i just got a pair of toms too!! this makes five pairs for me. they are the best! you definitely should get them!